About four days into cutting down and stripping my indigo of its leaves, then slowly and indirectly heating it for hours with rain water, oxidizing it, reducing it, and finally dyeing with it while keeping it at 100-120 degrees, a 6 1/2 hour process from start to finish, I started to second-guess myself. Who would do this, and why? If you have spent any time looking into small-batch yarns, listening to Woolful, or following Buckaloo View or Mandarine's on Instagram, you are going to find yourself exposed to natural dyers and their philosophy and passion for turning plants into color. Maybe you aren't the kind of person this will impress. If however, you've ever wondered how hard it really would be to mix your own oil paints, or you've chemically engineered your own ceramic glazes, or made your own ketchup, cheese, or cultured butter, you might say to yourself, "Well, this seems reasonable." So I bought a book. Rebecca Burgess' Harvesting Color. In the meantime I ran across a Martha Stewart Living feature on Folk Fibers, a quilting business created by Maura Grace Ambrose. She hand dyes fabric with natural materials, machine pieces them into modern interpretations of traditional quilt blocks, hand-quilts with Japanese sashiko threads, and sells her finished quilts on her website. They're amazing, but about a million light years outside of my price range. At the same time I discovered the Miss Mustard Seed blog by Marian Parsons, about refinishing and thrifting to decorate a home. Her style is very French country and a bit too feminine for my taste but there are aspects I do gravitate towards: her milk-painted furniture (she actually has her own line of paint), love of white ironstone and flow blue, and her blue-and-white decorating schemes. She has a knack for finding the prettiest antique blue and white quilts. And there it is: a peak behind the curtain; how three elements become one compound in the chemistry of my mind. "Let's grow some indigo, dye some fabric and thread, and quilt some amazing blue and white pillows." I've never quilted before so let's at least be reasonable about size, if nothing else. Japanese indigo seeds aren't commonly available so in January I tracked some down on Etsy (from MilkweedQuilts). I started them on my kitchen windowsill in February, pressing three seeds per desired plant into growing medium and keeping moist until sprouted. Once all the sprouts had some true leaves, I thinned them, keeping only the strongest sprout of the three per desired plant. By April I had 48 healthy little indigo plants in need of transplantation. I had a 4 ft by 25 ft total area to dedicate to the plants so I only ended up planting the 38 healthiest. Because we had several spring projects this year, I didn't actually transplant the indigo until late April. They had been hardening off for several weeks at that point. They filled in well throughout the summer and became really attractive when blooming. In late August/early September, they were pollinating like crazy and every bee for miles was buzzing around that patch. During this time, my husband and I both experienced some nasal irritation. One of my dogs also seemed to show signs of skin irritation. If I plant indigo again, I'll move the patch to an area my dogs don't tread. I started chopping down and stripping the leaves off of my plants Monday, October 5. It was on Thursday that the opening paragraph took place. To ease the time commitment (I thought I'd be dyeing for a week to get through all of my indigo; I dyed for three), my husband and our friend Zach helped me strip the leaves and prepackage them into one-pound Ziplock bags full. I stored them in the refrigerator until it was time to use them. In the end, my 38 plants yielded just over 11 pounds of leaves; enough for 11 batches of dye. I dyed four or three days a week, ending on Friday, October 23. Dyeing from fresh leaves does not yield the indigo we're accustomed to associating with dark blue jeans. There just isn't enough dye in the leaves to produce such strong coloring. 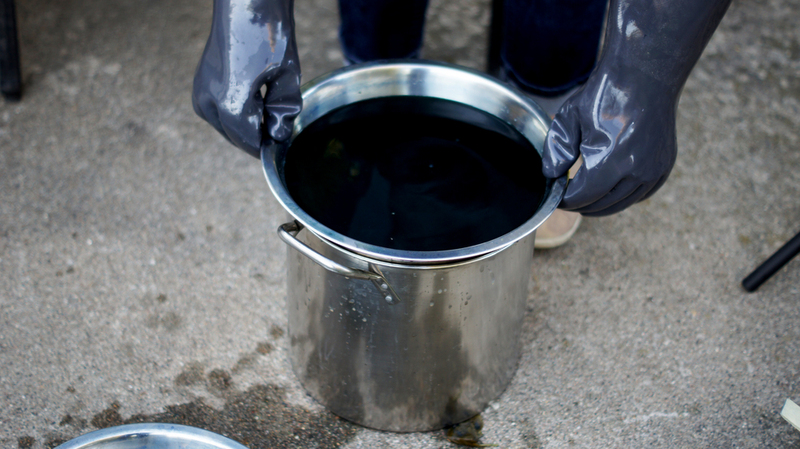 Natural dye on that scale is done by drying the indigo plants, stomping them to separate the dried leaves from the stems, extracting indigo from the resulting powder, and using that product in a fermented indigo vat. From what I understand, such vats are akin to bread starters: they take a great deal of time and precision to start and must be fed regularly to maintain. Also, there is, apparently, a mountain of misinformation out there about how to successfully produce a fermented indigo vat due to attempts to conceal effective methods from competition. For the cotton pieces I dyed (about 4 1/2 yards worth, in 18-inch or 20-inch lengths to best fit in my dye vat), three to four 10-minute dips produced a nice medium blue. I rotated the order in which I dyed them to try to keep the vibrancy of the color even across the board. For example, when a batch of dye was ready, I first dyed piece A, then piece B, then piece C and hung them up to dry. For the next batch, I first dyed piece B, then piece C, then piece A. For the third batch, I dyed piece C, then piece A, then piece B. 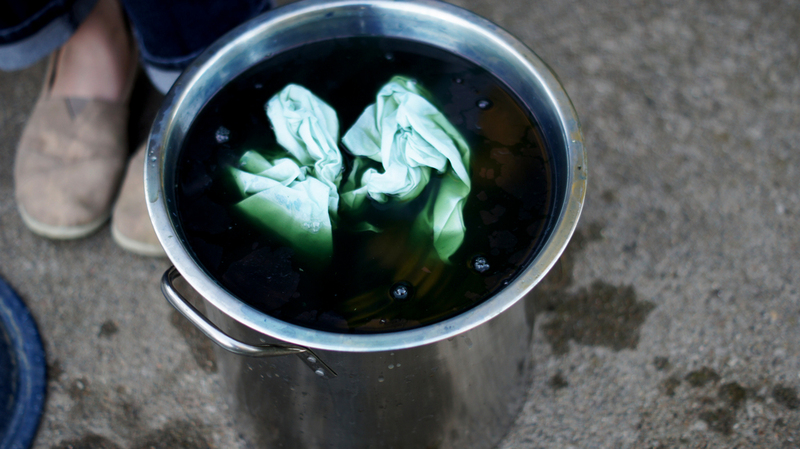 For the fourth batch of dye, I started over with three new pieces of cloth. In this way I tried to make the most of each batch of dye. Indigo is also possessed of a strange quality (see Technical Notes below for more information) which can lend itself to some pretty interesting and sophisticated tie-dyeing techniques called Shibori: the dye will not penetrate a fold in fabric. To get even dyeing of my fabric, then, I varied the way I put it into the dye: the first time was scrunched up, the second folded as little as possible, the third scrunched up again. The sashiko thread I dyed went into the pot only once (I dyed 8 packages of 44 yards each) and occupied the A position. The yarn, a locally grown and milled Rambouillet, was dyed three times. Each skein traveled through all three A-B-C positions in the dye pot. The skeins weighed 2.5 ounces each. With my hand-dyed indigo fabric and sashiko thread, I plan to try my hand at some quilting come January (with holidays looming, I can't see starting any earlier). The finished pillow covers will likely be 1 year+ in the making. Truly a labor of love! The wool will need some careful consideration. Rambouillet wool ranks with Merino for softness but the breed is hardier for colder climes, making it a perfect soft-coat breed for Iowa. I may knit it up into a cowl, something beautiful and functional that won't see too much wear during use. I'm really excited about these skeins because they are 100% Iowa: sheep raised a couple of hours north of here, wool milled down the road from the farm, dyed with plants raised in my backyard, and knit in front of my fireplace. So cool! I'll be certain to share the finished product. Pluck one pound of leaves from indigo plants and stuff into the gallon glass jar. If you snap the stems from the plant, you can leave a couple of nodes above the ground and it will grow back for another harvest (if you're not waiting to do all of this until October like I did). On my own, this took between 1.5 and 2 hours. Pour warm/hot rainwater over leaves, fill the jar, and screw the lid on. Why rainwater? It doesn't have (the degree of) chemicals like municipal water so the color extracted from the leaves will be as pure as possible (little or no potential for unforeseen chemical reactions or interference). Set the trivet inside your stockpot, followed by the jar of leaves. Fill the stockpot with more rainwater until as close to the top as reasonable. I brewed my indigo leaves on my stove top so in order to get everything inside without making a huge mess, I removed the jar of leaves and carried it and the stockpot of water inside in two separate trips, then reassembled them on top of my most powerful burner. 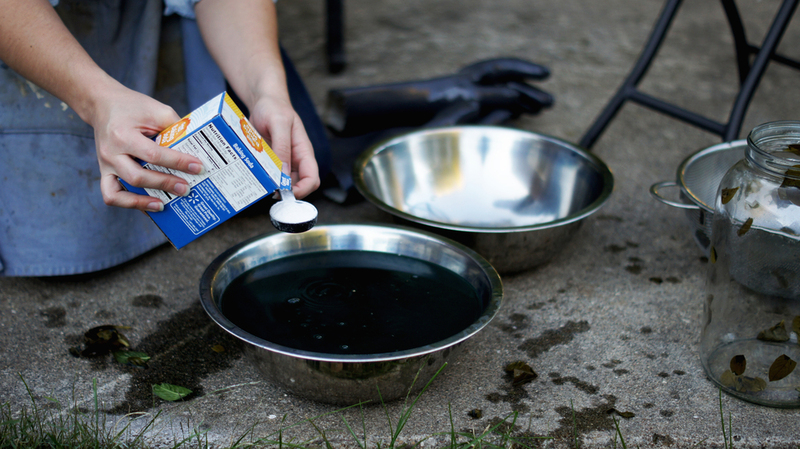 Fit a candy thermometer to the side of your pot and turn your flame on to medium. The rest of this process is fully illustrated in the gallery below; please reference it, particularly for checking the variations in color I'll be discussing (click on pictures to enlarge). Turn off the flame and carefully remove the glass jar with grilling gloves (yes, it will be hot!). Put the lid on your stockpot to keep the water steamy. 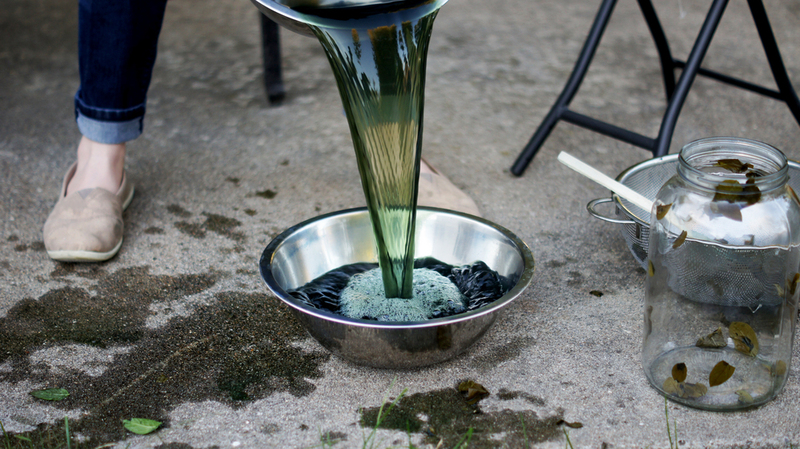 Move the glass jar and the stockpot with water outside to your dyeing space. Fit your colander over one of your 5-quart bowls and empty the contents of the glass jar into it. Lift out the colander, letting the bowl beneath capture the dripping liquid before transferring to the second 5-quart bowl. Squeeze out as much liquid as possible from the leaves and discard (these can be composted or, apparently, rebrewed for a neutral-colored dye). 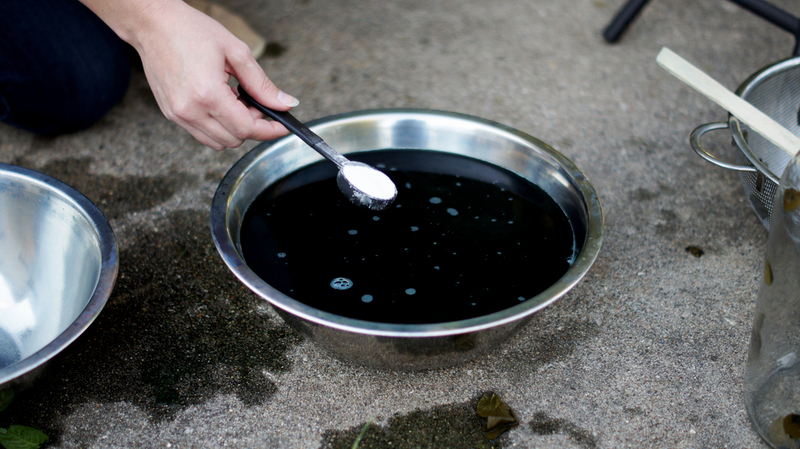 Add the squeezed liquid to the larger bowl of dye and stir in one tablespoon of baking soda. Now you must oxidize the dye bath (see Technical Notes below for more information about the chemical forces at work). To do this, you will pour the dye between the two bowls, taking care not to splash out all the liquid while trying to introduce as much air/bubbling as possible. It will start out looking straw-colored when poured; when oxidized, it will have turned darker and look like an emeraldy blue-green. This only took me about 5 minutes to achieve, although Rebecca Burgess warns it may take 6-10 minutes. Now the dye must be reduced (see Technical Notes). Gently stir in one tablespoon (heaping is okay) of Spectralite. Add your fabric to the water in your stockpot to soak, then place your dye bath on top of the stockpot to keep warm (you want the dye to stay in the 100-120 degree Fahrenheit range). 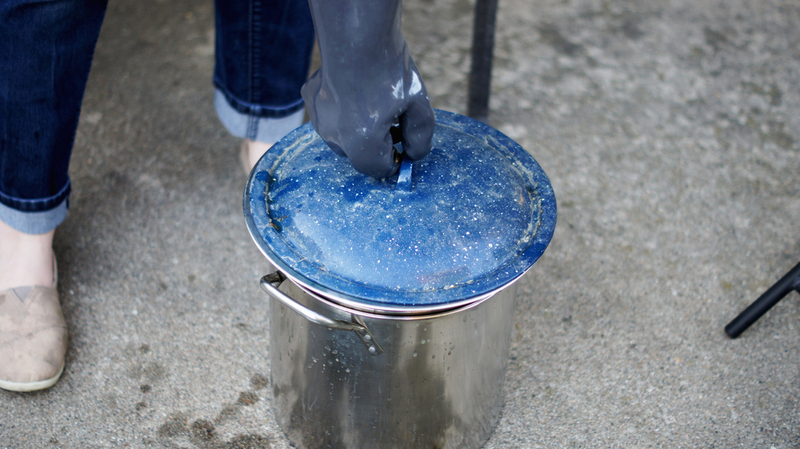 Cap everything off with a lid large enough to span the dye bath's bowl. Set a timer for 10 minutes to allow the chemical reaction time to take place. After 10 minutes, remove the lid and the dye bath from the stockpot. It will be difficult to see a difference in the color of the dye, however, you should notice a difference in the surface of the liquid. It will seem like a second surface is floating on top of another layer of surface; it will slip around as you move the bowl and shatter into pieces if you stir the dye bath (only do so gently, you do not want to introduce air into the dye). 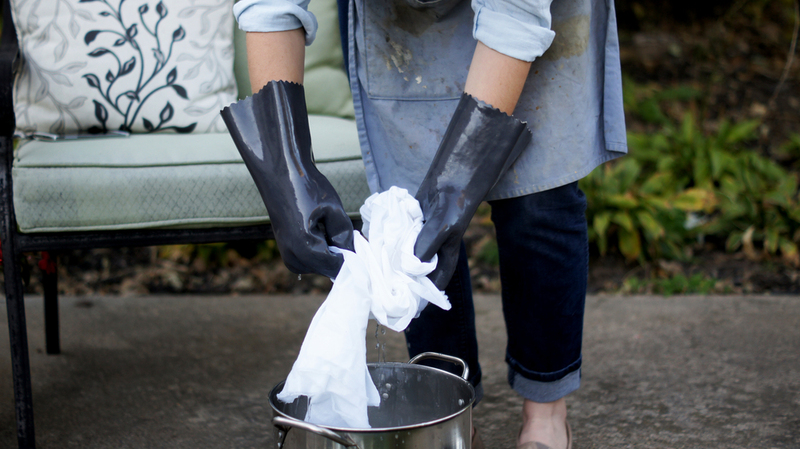 Remove your first piece of fabric/skein of fiber, etc from your hot rainwater and wring/drain, as appropriate, until no longer dripping (you want to avoid dripping water into the dye and introducing oxygen). Add to dye and reposition bowl on top of stockpot to keep warm. Now you will be able to see the difference in the color of your dye, which should now be "Indigo White." This color varies from bright yellow to the chartreuse in the picture below. Set a timer for 10 minutes, which is how long it will take for your fiber to "absorb" (see Technical Notes) as much indigo as it will take. If your fiber does not fully sit beneath the surface of the dye, you may have to gently agitate it from time to time. If everything is fully submersed, put the lid back on the dye to keep warm. 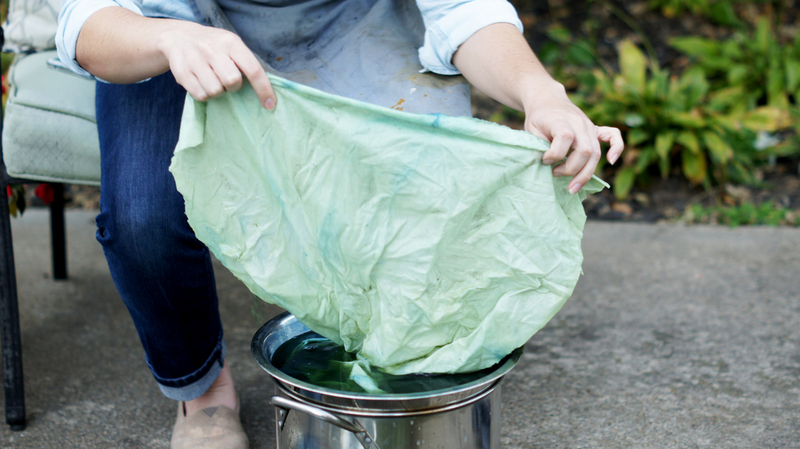 After 10 minutes, your fabric/fiber will appear to be dyed a bright yellow-green. Carefully remove it and allow excess dye to drip back into the bowl without splashing, always avoiding the introduction of air. 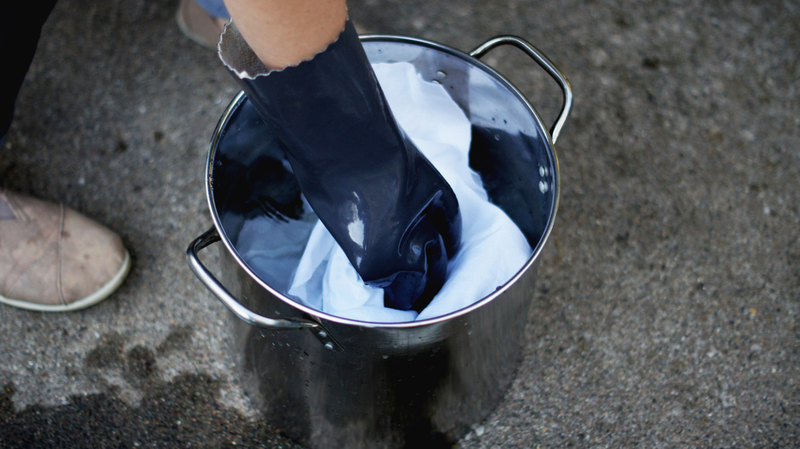 As your dyed fabric/fiber hits the air, it will begin changing color; the indigo it has absorbed is oxidizing. After only a few moments, it will appear turquoise. Hang it up on your clothesline to dry. When dry you'll be able to see the completely oxidized color of the indigo. A note about re-dyeing: I have read suggestions to allow your fabric/fiber to oxidize from 20-30 minutes before attempting to dye again. However, I had the better results when I allowed mine to completely dry before attempting to re-dye. Once you have dyed your fabric/fiber to your satisfaction and it has completely dried, rinse it out very thoroughly to remove the excess dyeing liquid (it will look yellow and will cast a yellow tinge on your unrinsed fabric/fiber). For my cotton fabric, I just put it all in a rinse/spin cycle in my washing machine and then into my dryer. For the wool and the sashiko thread, I filled the bottom of my bathtub with lukewarm water and soaked everything for about half an hour, very gently agitating the wool occasionally to thoroughly rinse it without felting. These items went back up on the line to dry completely. 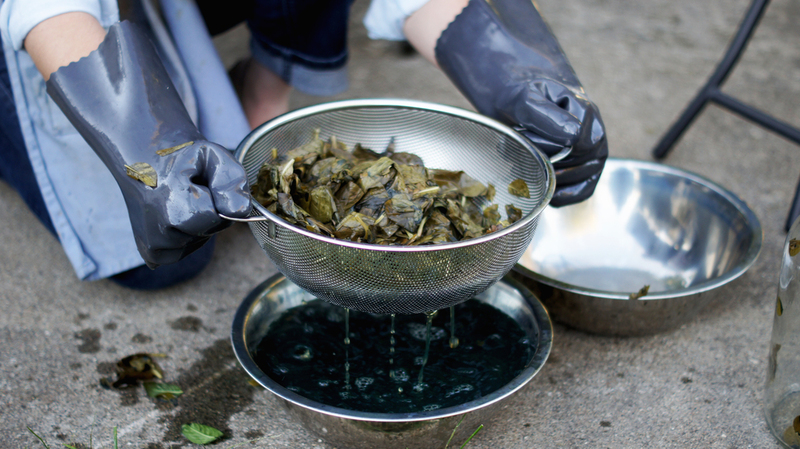 For an alternative way to dye with fresh Japanese indigo leaves, click here for Rita Buchanan's recipe and method. There is some interesting chemistry at work during this process. While I am by no means an expert, I'll attempt to explain what I learned after a few hours of internet research. Indigo is actually a compound which can be derived from several hundred species of plants, rather than a specific plant unto itself. However, extraction requires several steps because only indigo’s precursor, indican, colorless and water-soluble, exists in nature. Steeping indigo leaves in water releases this compound, creating an indican rich solution (which decomposes at temperatures in excess of 180 degrees Fahrenheit). Adding a base, such as baking soda, to raise the solution to a pH of 8-9 promotes the hydrolysis of indican; this chemically controlled decomposition yields indoxyl. When oxidized with atmospheric oxygen (exposed to air), indoxyl molecules join with oxygen to form indigo. Indigo, however, is not water-soluble and will simply sink to the bottom of the solution. 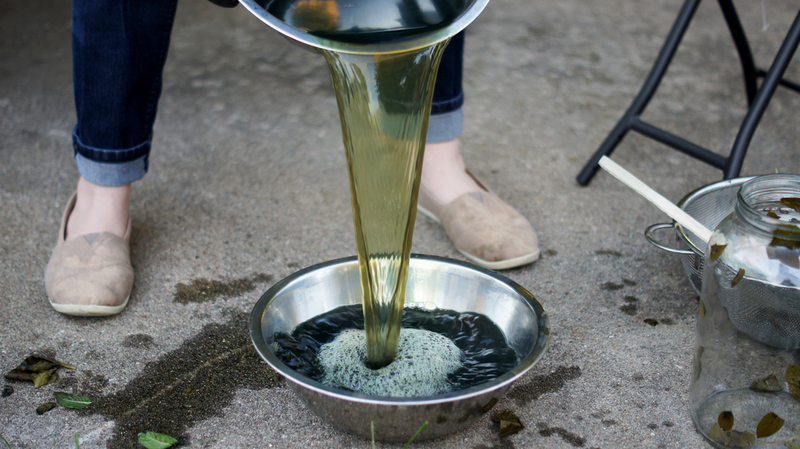 At this point, you could actually strain it out of the liquid and dry it as a powder or compress it into a cake (click here for a relevant blog post on doing just that). 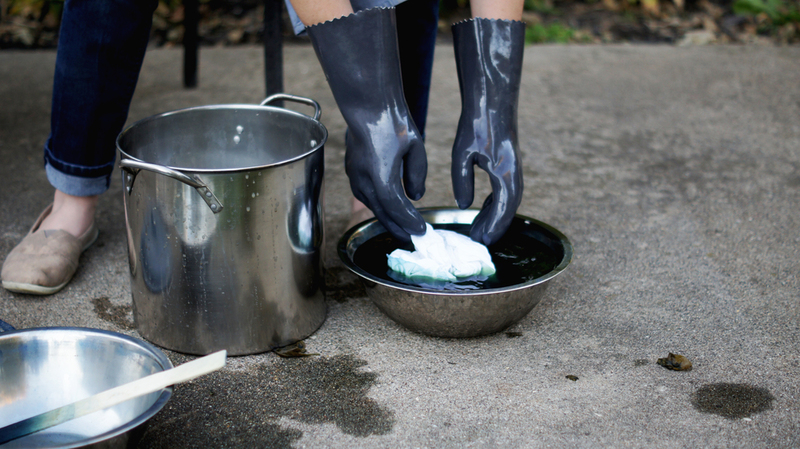 To make indigo water soluble, and therefore useful as dye, it must be chemically reduced. The addition of spectralite (thiourea dioxide), a textile reducing agent, will cause this chemical reaction with indigo. Without getting too complicated, this is a process in which electrons are “donated” and “received,” historically, in the form of oxygen ions (although we now understand that other substances can also play a similar reduction/oxidation role as oxygen). Suffice it to say, the reduction of indigo by thiourea dioxide yields leuco-indigotin, a yellowish soluble dye, known colloquially as “Indigo White,” which attaches itself only to the surface of fiber. This is why indigo-dyed denim develops a worn patina: the dye only sits on top; when that has been worn away, the undyed fiber core is revealed. This property is also what makes the Japanese art of Shibori possible: when fabric is folded or bound, the leuco-indigotin will not dye those sections because their surface area has been made unavailable. When fiber dyed with leuco-indigotin is removed from the dye bath, it immediately begins oxidizing because of its exposure to atmospheric oxygen, reforming into indigo. This happens quickly before the eye as a color change from yellow-green to brilliant blue. Complete oxidation is achieved after 20-30 minutes.